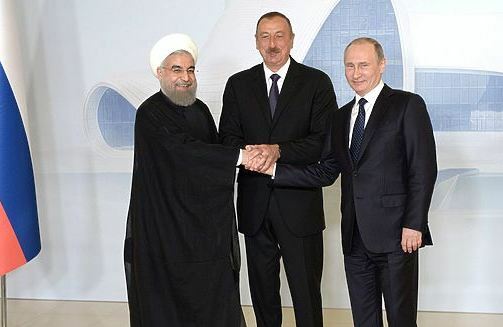 The first ever trilateral meeting of the leaders of Azerbaijan, Russia, and Iran – Ilham Aliyev, Vladimir Putin, and Hassan Rouhani, took place in Baku on August 8, 2016. “This is a landmark event. Today the three countries are creating a new format of cooperation,” the Azerbaijani president said at the summit of the three leaders of the Caspian Sea region. A new format of cooperation that is taking shape between Azerbaijan, Russia and Iran may change the political and economic map of the region in the future. Aliyev is hopeful that the International North-South Transport Corridor project will be implemented in the near future. “At present, there is a railway communication between Russia and Azerbaijan. This year, we adopted a decision that Azerbaijan will extend its railway up to the Iranian border. I hope we will achieve this within the coming months,” Aliyev said. He recalled that the ground breaking ceremony for the construction of a railway bridge over the River of Astara on the Azerbaijani-Iranian border had been held recently. “These infrastructure projects are integral part of the North South Transport Corridor, which is a transnational project of strategic importance. In the future, this corridor will benefit many countries. This corridor has a very high economic viability. This route is very favorable for the transportation of transit of goods from the point of view of time. I do hope that together we will achieve the realization of this project soon,” the Azerbaijani leader said. Experts say the new format of relations between the three countries will change the geopolitical picture of the region. Vladimir Lepekhin, Director General of the EurAsEC Institute, explains the negotiations with the leaders in the region with the Kremlin’s recent efforts to increase Russia’s role in the Near East and Middle East, in particular, through Iran. “Actually, we are witnessing formation of a system of classical union involving Azerbaijan and Turkey. The meeting of the Azerbaijani, Iranian, and Russian leaders in Baku is a new page in the modern geopolitics. It was high time to open that page, but the process was impeded by the known forces that strived to control the region and each of the above countries separately. We are well aware who has been pressing Iran with economic sanctions and is now trying to bring Russia to knees by the same methods. It is clear who attempted to make state coups in Turkey and Armenia a few weeks ago to impede the rapprochement of the countries in the region and the launch of an independent trans-regional dialogue without intrigues by various overseas mediators. I think the elites in our countries have gradually begun to understand that the West is turning into a source of headache and escalation of war rather than a source of investments and economic development,” the expert told EADaily. Iranian political analyst Hadi Dehhan Bazarafshan says the cooperation of the three countries of the Caspian Sea region is very important in view of the West’s pressure upon them. “The cooperation of Iran and Russia as two regional leaders is very important for withstanding the West’s sanctions and strengthening the positions of Moscow and Tehran, as well as changing the international political system,” he says. In his words, Russia is not only the largest country in the world, but also the world’s second country by its military power and one of the leaders in global politics. “Russia is one of the most serious neighbors of Iran. For some geopolitical reasons, today Russia is trying to strengthen its positions in the regional and international policy. The West’s pressure and sanctions against it over the conflict in Ukraine and Crimea’s reunion with it resemble the pressure and sanctions of the EU and USA against Iran. Washington is trying to increase its role in the global arena and weaken Moscow’s position in our region and in the world, generally. At present, USA has two major opponents in the global policy – the Russian Federation and the Islamic Republic of Iran – that do not let it achieve its goals promptly and easily. USA tries to achieve its goal by isolating our countries. Therefore, the summit of the three countries was a landmark event,” the Iranian political analyst told EADaily. Azerbaijani political analyst Zardusht Alizadeh forecasts a great success to the new format of cooperation between Azerbaijan, Iran and Russia. He is sure that Azerbaijan will benefit from such model of relations. “The major issue of that format of cooperation is the implementation of the North-South Transport Corridor. When the new road is put into service, Azerbaijan as a transit country will just benefit from it and earn hundreds of millions of dollars. It is a brilliant opportunity to develop regional cooperation. And if Baku, Moscow and Tehran decided to establish such relations, it should be welcome,” he told EADaily. Alizadeh is sure that Azerbaijan’s role of a regional power is growing, otherwise such big powers as Russia and Iran would not choose Baku as the place of their summit. He is sure that the West has no reason to show any discontent, as the cooperation of the countries in the region is in favor of everyone. In fact, it is very hard to cover all the issues discussed at the trilateral and bilateral meetings on sidelines of the summit in Baku. They discussed cooperation in the field of culture, tourism, youth exchanges, education, promotion of direct ties of the three countries, as well as agreed to set up task forces in the areas of mutual interest. Actually, the leaders have agreed upon a range of issues of mutual importance and it remains for the relevant departments to implement them. The major outcome of the summit was the implementation of the North South Transport Corridor that will ensure a big inflow of tourists, finance and goods for the three countries. This project will make the region more attractive and important both economically and politically.